Being a vegetarian in today’s day and age is quite a difficult thing to do, as there are almost too many recipes, cooking shows, and nutritional advice that contain meat, and therefore it is quite hard to maintain a fulfilling diet that is full of incredible vegetarian dishes. 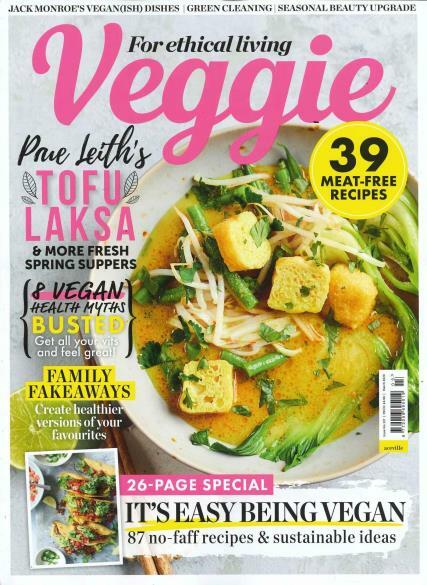 No matter if you are a long time vegetarian cook or if you just are looking for something a little different to add to your diet, Veggie magazine has everything that you would ever want in one entertaining publication. This is a great magazine which is full of easy to follow instructions for vegetarian and often vegan recipes with colourful pictures to get your tastebud's going. There are always great competitions to enter every month and a handy 'yourletters' page where the magazne often answer your questions like where to find a vegetarian friendly product or replacement - recommended. This mag is brilliant, every month it is full of good ideas and never falls short in offering something new. It has a lot of ideas from subscribers and well known chefs alike. I've subscribed for over a year now and would not be without it.